In a similar fashion to Green Lantern, I came to this movie as a long time fan of the source material. I have all the Tintin books, even the early black and white super-racist ones. Hell, I even have ‘Tintin and the Alph-Art’, the unfinished final adventure, which mainly consists of stick figure sketches. Being such a fan, however, does have its drawbacks. 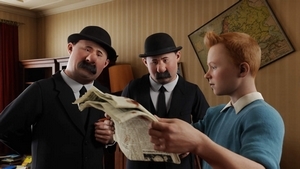 For much of The Adventures of Tintin, I was distracted by the changes that had been made from the source material. Not in the sense that I was displeased, but rather that I was constantly aware of which bits had been faithfully adapted, which had been cut, and which had been snatched from other books. It meant that I didn’t take in the film unfolding before me in quite the manner I should have. In this regard, I’m certain that a second viewing will yield a much more favourable response. 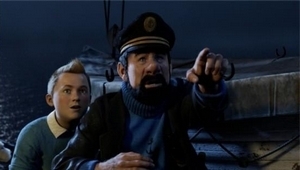 This take on Hergé’s most famous creation takes elements from ‘The Secret of the Unicorn’ and ‘The Crab with the Golden Claws’ for the most part, whilst – surprisingly – ignoring most of ‘Red Rackham’s Treasure.’ This means, of course, that the potential franchise (let’s not pretend this is anything less) kicks off with Captain Haddock in tow. The mostly excellent Ellipse/Nelvana animated series from the early 90s did the same thing by changing around the order of the adventures, so that ‘The Crab with the Golden Claws’ screened first. In a rather strange move, however, the film makes reference to Tintin’s previous exploits, including ‘The Broken Ear’ and ‘Cigars of the Pharaoh’, meaning that these can’t ever really be explored in the future, unless in a prequel form. It seems strange that the filmmakers would limit themselves in this fashion, as I would have expected them to one day use such adventures and simply injecting Haddock into the storyline (as Hergé himself did this with ‘Land of Black Gold’, which was commenced before the creation of Haddock and completed after he was a regular character). Such geeky observations aside, The Adventures of Tintin sees Spielberg in full Indiana Jones mode. Some may indeed argue the film gives Kingdom of the Crystal Skull a ride for its money in terms of sheer thrills. A couple of the action set pieces are truly astonishing, and it’s interesting to see what Spielberg does when he isn’t limited by traditional filmmaking techniques. That’s not to say he’s taken anything away from what makes Tintin great. The action comprises that perfect blend of the heroic and accidental, just like the original comics. The script, courtesy of Stephen Moffat, Edgar Wright and Joe Cornish, clearly has a fondness for Hergé’s works, and the spirit of the original stories is very much alive. There are several winks to über-fans like myself, but thankfully they don’t distract from the overall film. Motion capture CGI has really come a long way. The film aims for photorealism except for the character’s faces, which closely resemble Hergé’s creations. The level of detail when it comes to the digital sets, textures and lighting, however, means that whenever faces weren’t on screen, I could have easily been convinced I was watching live action. The process has advanced in leaps and bounds since the likes of Beowulf, and I had no problem with the eerie zombie eye-effect common to most mo-capped movies. I saw the film in 2D because I didn’t want to be distracted by the carnival sideshow nature of 3D, so can’t comment on how more or less effective the film is when paying a premium to wear annoying plastic glasses. John Williams’ score is perfect, and far superior to the clumsy themes he created for War Horse. Sure, there are times when it’s a little too similar to his work for the Indy movies, but for the most part it’s perfect. The casting is also spot on: Jamie Bell, Andy Serkis, Nick Frost and Simon Pegg are all perfectly suited to the task, whilst Daniel Craig really gets to let loose as the villain of the piece. I’m dying to see this a second time. The only real criticisms would be that the film doesn’t stop to take a breath, and occasionally the action scenes are so incredibly busy that it’s difficult to take everything in. That being said, these complaints pale in significance to the fact that The Adventures of Tintin includes a naval battle that outdoes anything done in any of the Pirates of the Caribbean movies. This entry was posted in Film Reviews and tagged Action/Adventure, Comedy, Comic Book by Stuart Wilson. Bookmark the permalink.